Comments: Busted open is the 1st thing that comes to mind as I describe this paint wether. No doubt the thickest wether in the sale, he is packed full of muscle and shape. Massive footed with lots of leg hair, he is great structured and stout made. 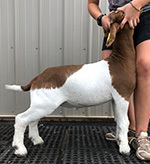 The Double Stuff buck is a twin to the Reserve D3 Wether at OYE in 2017. Notes: Hauling Options: Darren Clouse 765-412-2453 or Bob May 530-200-0866. Comments: 1968�s balance and profile will quickly catch your eye when you walk in the pen with this set. This wether is way good in his neck set and body with a tucked up chest that balances really well back through his flank. This one is big backed and has a huge hip. Super hided with a great touch, this one could be fun to haul around. Comments: This spotted backed wether is wicked in his design and body type. He has the silhouette when viewed from the side that we all look for in show wethers when you get them turned sideways. I really like the way this one is made, big pin set, square at the ground, he�s a nice goat. Comments: The best description for 2142 should simply read - super complete livestock from the ground up � and lot 4 fits that to the �T�. This type of livestock does not go out of style and they continue getting banners, year in and year out. The spotted necked wether is wide at the ground with a big foot, and is way cool up through his shoulder and front end. he is built like a wedge from front to rear and runs up hill like show goats are supposed to do. The Godfather wethers continue to get banners, he sired the Reserve D6 Wether at Tulsa just a couple weeks ago. Comments: �My Turn� is truly a uniquely made buck. He�s busted open in his chest and front end, but still as shallow as any buck out there today. His round rib and body shape are topped with a massive rack and loin. He is super thin hided and has the great touch needed in the show ring today. �My Turn�s� dam comes from the most consistent No Way doe families we own. 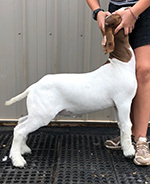 She is maternal sib to the dam of the Reserve Grand Wether Dam at OYE in 2018, the 2018 SW District Reserve Grand Doe, and a class winner at the Georgia National in 2018. Winning genetics are stacked in this guy. I would suggest breeding �My Turn� to thicker hided does that need to be busted apart both coming at you and going away. 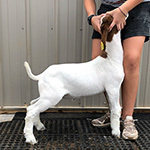 I think he is going to help make offspring that are super shallow in their design with a great look and lots of handle. Notes: Shirt is available in small, medium, large, x-large and 2X. No cost for shipping. Proceeds will go the the Oklahomashowgoats.com Scholarship Fund.